Former officers in IDF, Police warn Plesner Committee hareidi enlistment will be bad for women's movement. A group of women who served as officers in the IDF, police and prisons services warn that female soldiers' rights could be adversely affected by letting more hareidim into the army – as the Plesner Committee has been tasked to do. "The people's army must not turn into the men's army," they warned in a letter to the Prime Minister and Defense Minister. "We must not fix one wrong by creating another." 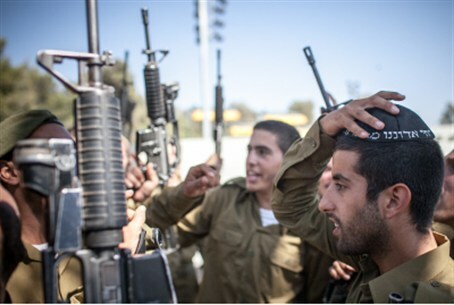 "Over the last year we have been exposed to a growing number of worrisome reports of religious extremism in numerous places within the IDF," the women wrote. "The media and women's groups receive reports of numerous instances of exclusion of women and violation of female soldiers' rights due to demands by external elements, and by hareidi or religious officers and soldiers." They mentioned cases in which soldiers refused to be taught by a female instructor, and a case in which a female officer was not appointed to a battalion "because a hareidi commander intervened." The signatories include Brig. Gen. (res.) Orit Adato, the former Head of the Prisons Service, Brig. Gen. (res.) Yisraela Oron, former IDF Spokesperson Brig. Gen. (res.) Ruth Yaron, Col. (res.) Miri Eisen, who was the prime minister's advisor on foreign media during the Second Lebanon War, Brig. Gen. (res.) Yehudit Ben Natan, Brig. Gen. (res.) Rachel Dolev, former Chief Censor and Chief Military Defender, Brig. Gen. (res.) Suzie Yogev and other former senior officers. WIZO, Naamat and other veteran Zionist women's groups have become increasingly influenced over the past two decades by the militant feminist line advanced by smaller and highly radicalized groups created by the New Israel Fund. Feminization of the IDF, including combat units, is one of the issues promoted by these groups.